1 On the third day there was a marriage at Cana in Galilee, and the mother of Jesus was there; 2 Jesus also was invited to the marriage, with his disciples. 6 Now six stone jars were standing there, for the Jewish rites of purification, each holding twenty or thirty gallons. 7 Jesus said to them, “Fill the jars with water.” And they filled them up to the brim. 8 He said to them, “Now draw some out, and take it to the steward of the feast.” So they took it. 12 After this he went down to Caper’na–um, with his mother and his brothers and his disciples; and there they stayed for a few days. The word “epiphany” means ‘manifestation’. The Feast of the Epiphany originally celebrated three manifestations of Jesus: to the magi or wise men, at his baptism and at the marriage feast of Cana. As we celebrate this feast we should be aware that the Gospel reading is emphasising a manifestation of Jesus. John summed up his reason for writing his Gospel in these words, “Now Jesus did many other signs in the presence of the disciples, which are not written in this book; but these are written that you may believe that Jesus is the Christ, the Son of God, and that believing you may have life in his name.” (Jn 20: 30–31). In chapter 2 he reveals who Jesus is by the wedding at Cana and the cleansing the Temple. After that he describes how certain people came to faith in Jesus (Jn chapters 3 and 4). 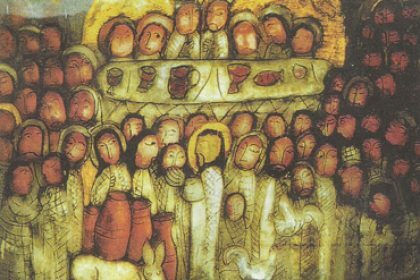 This offers us a clue that there is more to the wedding at Cana than a mere historical celebration; the sign that is offered has a deeper meaning which we are to seek. For Jewish people a wedding was not just between a man and a woman. It was a sign that God himself is the bridegroom and the people of Israel are the bride (Is. 54: 5). In the New Testament Synoptic writings Jesus is described as the bridegroom. In Ephesians chapter 5, marriage between a man and a woman is likened to the marriage of Christ and the Church. John had these sources in mind when writing his Gospel. Added to this is the fact that the Jews regarded a wedding banquet as having messianic overtones [“Christ” is English for the Greek name for ‘Messiah’] (Is. 25: 6; 55: 1–11). See The Catechism of the Catholic Church, 796. We keep these thoughts in mind as we reflect on the wedding feast at Cana. “On the third day” — There are two implications to these words. First, this is the seventh day in John’s Gospel. Four days are mentioned in chapter one: Jn. 1: 29, 35, 41, 43. “On the third day” in chapter two means on the third day after Day Four, that is, the seventh day. Jn. 1: 19 to 2: 12 is a new creation story. Second, verse 11 will explain that on this day Jesus manifested his “glory”. 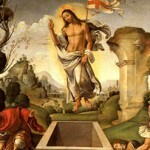 This is what he did when he rose from the dead at the resurrection after three days in the tomb. This connection is not to be ignored. The term “third day” is used in Ex. 19: 16 to indicate that God was about to make a revelation. We are alerted that this present passage is a special revelation. “there was a marriage” — Knowing that something special is about to be revealed, this reference to marriage prepares us to expect a reference to the Messiah or the messianic era. The messianic era was frequently referred to as a marriage with wine and abundant fine foods (Hos. 2: 19–20; Is. 25: 6–8; Jer. 2: 2; Joel 3: 18–24; Amos 9: 13; Song of Songs). “at Cana in Galilee” — Cana is seven kilometers north–east of Nazareth. “and the mother of Jesus was there” — John never calls Mary by her name but she is mentioned here (verse 1) at the beginning of Jesus’ public ministry, in verse 3 twice and in verse 12 as “the mother of Jesus”. Obviously she is being highlighted for the very special role she is to play as Jesus’ mother in this passage. She will be referred to in 6: 42 as his mother but nothing is said about her other than she is his mother. The next reference will be at the crucifixion (Jn. 19: 25–28), which is the conclusion of his public ministry when Jesus will bequeath his mother to the Beloved Disciple on behalf of all his disciples as their mother. By this title of motherhood Mary is described in relation to her son; he is central to this passage. Mary is mentioned but not St. Joseph. After the finding of the boy Jesus in the Temple, Joseph is not referred to as being alive in any of the Gospels. This could mean that he died before Jesus commenced his public ministry. “Jesus also was invited to the marriage, with his disciples” — Only five disciples have been mentioned so far in chapter one. “When the wine failed, the mother of Jesus said to him, ‘They have no wine.’” — The women guests at a wedding would help with the catering and Mary saw that the wine was depleted. She does not ask for a miracle but she depends on her son to do something for the wedding hosts. “And Jesus said to her, “O woman” — In our culture this word sounds harsh when Jesus uses it of his mother. In the culture of his day Jesus uses it here and on the cross (Jn. 19: 26), as a formal way of addressing his mother. He certainly would not have used it in a disrespectful manner on the cross. We can be sure that he would not have used it in a disrespectful manner at the wedding, as some have alleged. On three other occasions he addressed women with this term, never disparagingly: the Samaritan woman (Jn. 4: 21), the person caught in adultery (Jn. 8: 10) and Mary Magdalene after his resurrection (Jn. 20: 15). Eve, the woman of the first creation, was called the mother of all life. Jesus calls his mother “woman” because she is the new Eve, the mother of all life in the new creation which John implies in this present passage. In Genesis 3: 15 we read: “I will put enmity between you and the woman, and between your offspring and hers; he will strike your head, and you will strike his heel”. The word “woman” here refers to Mary and her “offspring” refers to her son who is the Messiah who will eventually crush the devil. By referring to the “mother of Jesus” as “Woman” John reveals her role in relationship to Jesus, the Messiah. “what have you to do with me?” [JB — “Why turn to me?”; literally — “what to me and to you?”] — Colloquially we can describe these words as Jesus saying to his mother, ‘Do you realise what you are saying to me? You are launching me on the final stage of my mission and “my hour has not yet come”’. “‘My hour has not yet come;” — This is Jesus’ first of twelve references to “my hour”. See: Jn. 2: 4; 4: 21, 23; 5: 25, 28; 7: 30; 8: 20; 12: 23, 27; 13: 1; 17: 1; 19: 27. “Hour” is one of the key words in this Gospel. The expression normally refers to his passion and death but can also refer in places to his second coming in glory. “His mother said to the servants, “Do whatever he tells you.” — These are not the words of a mother who has felt that her son has rebuked or treated her harshly. These are Mary’s last words in the New Testament, her legacy to all his followers and disciples. These words of “the mother of Jesus” are words of the perfect disciple. She sums up the response of those who wish to be his “servants” and disciples — they are to listen to the words of Jesus and obey them with docility. Mary launches Jesus on his public ministry. After this people will know something of his powers and his life will not be ‘hidden’ any more. Now six stone jars were standing there, for the Jewish rites of purification, each holding twenty or thirty gallons” — The jars could contain about 100 to 150 gallons, 500 to 700 litres of water. They were used for washing hands before eating and other purifications (Nm. 19: 11–22). The word “six” has a special meaning. It suggests imperfection, inadequacy. In this case, for John it meant that the water for purification was inadequate; it was not able to really purify people. The deeper meaning is that the Old Covenant or Testament was inadequate to purify people. That is about to change and Jesus will provide a sign by the “wine” of the messianic era. “Jesus said to them, ‘Fill the jars with water.’ And they filled them up to the brim” — The jars appear to have been empty as Jesus instructed the servants to “fill the jars with water”. The servants were most obedient, filling them “to the brim”. This is an example of perfect discipleship — listening to and obeying perfectly the word of Jesus in silence. The miracle that is about to be performed indicates the generosity of Jesus who gives abundantly (the jars were filled “to the brim”), a theme to be repeated in the multiplication of the loaves (Jn. 6: 9–13). The Old Testament referred to the messianic era as one of abundance of wine, oil, grain etc. (Amos 9: 13–15; Hos. : 2: 24; Joel 2: 24; 4: 18; Is. 29: 17; Jer. 31: 5). “Water” is a major theme in John’s Gospel (John chapters 2, 4, 5, 7, 9 and 19). “He said to them, “Now draw some out, and take it to the steward of the feast.” So they took it” — This miracle is different from all others. Jesus does not say anything nor does he perform any action such as laying his hands on the jars or water. Once again the “servants” are perfectly obedient to Jesus. John indicates a trait of Jesus here. Jesus allows people to share in his work and carry his gifts to others on his behalf. It is significant that the Greek word for “servants” here is “diakonia” which is a Church word for deacons or those who provide services. “When the steward of the feast tasted the water now become wine, and did not know where it came from (though the servants who had drawn the water knew), the steward of the feast called the bridegroom and said to him, ‘Every man serves the good wine first; and when men have drunk freely, then the poor wine; but you have kept the good wine until now.’” — There is no mention of a bride. The groom appears but says nothing. They are not important to the particular message being announced. The steward told the bridegroom that the wine was excellent, much better than the first. In this way he praised Jesus. Not knowing where the wine had come from, he pointed out to the bridegroom that supplying the best wine after the poorer was not the action of a normal man. Though he did not know of Jesus’ involvement the steward recognised as extraordinary that the best wine was produced at the end of the wedding feast implying that Jesus was an ‘extraordinary’ person. The deeper meaning of the steward’s remark is that the new wine which excels the old represents the Gospel as being better than the Torah or Jewish Law which dominated the Old Testament. This, the first of his signs, Jesus did at Cana in Galilee” — After the prologue (Jn. 1: 1–18), John’s Gospel is divided into two major sections: The Book of Signs (Jn. 1: 19 — 12: 50) and the Book of Glory (Jn. 13: 1 — 20: 31), followed by The Conclusion (Jn. 20: 30–31) and an Epilogue (Jn. 21: 1–25). In the Book of Signs John records seven “signs”: (1) changing of water into wine at Cana (2: 1–11); (2) cure of son of an official (4: 46–54); (3) healing of the paralytic at the Sheep Gate (5: 1–18); (4) feeding of the crowd (6: 1–15); (5) walking on the water (6: 16–21); (6) sight bestowed on man born blind (9: 1–41); (7) raising of Lazarus to life (11: 1–44). While John recorded seven special “signs”, the word occurs seventeen times in his Gospel. For John “signs” are not just miracles. The word indicates that there is something deeper, a special meaning to what Jesus has done, is doing or will do. “and manifested his glory” — Jesus “manifested his glory” by exercising his power as Son of God. “Glory” is a frequent word in John’s Gospel (Jn. 1: 14; 2: 12; 5: 41–44; 7: 18; 11: 4, 40; 12: 43; 17: 5, 22–24). So also is “glorify” (Jn. 8: 54; 11: 4; 12: 23, 28; 13: 31–32; 17: 1–5). “and his disciples believed in him” — The miracle performed is a special “sign” of Jesus’ “glory” which is here manifested for the first time in this Gospel. The disciples believed not because he changed water into wine but because of the meaning of the “sign” which revealed his “glory” that will be fully revealed at the passion, death and resurrection. “After this he went down to Caper’na–um, with his mother and his brothers and his disciples” — Capernaum was Jesus’ headquarters during his Galilean ministry. “His brothers” is a Jewish way of referring to extended family. Jesus’ mother is said to have been at the wedding but there is no mention that she was invited. Linking this with the reference to “his brothers” could suggest that this wedding had family connections with the Holy Family. They all returned to Capernaum together. The Catechism of the Catholic Church states: “Against this doctrine [of Mary’s perpetual virginity] the objection is sometimes raised that the Bible mentions brothers and sisters of Jesus. The Church has always understood these passages as not referring to other children of the Virgin Mary. In fact James and Joseph, “brothers of Jesus”, are the sons of another Mary, a disciple of Christ, whom St. Matthew significantly calls “the other Mary”. They are close relations of Jesus, according to an Old Testament expression” (CCC, 500). “Brothers” can also refer to disciples as in Rv. 12: 17, “Then the dragon was angry with the woman, and went off to make war on the rest of her children, those who keep the commandments of God and hold the testimony of Jesus”. “and there they stayed for a few days” — John has Jesus moving to and from Jerusalem. The verse following on this tells that Jesus went up to Jerusalem to celebrate the feast of Passover where he cleansed the Temple, another revelation or manifestation of who he really was. This APPLICATION must be very brief today because it is being taken from a short piece I am writing for the Parish Newsletter. That is a pity because it introduces St. John’s “Book of Signs”, (chapters 2-12 in his Gospel) In fact it ought not be here, in one sense, as this should be St. Luke’s Gospel in Year C. But that is another matter. At this stage we need to reflect on the teaching of the Bible on marriage. All marriage is meant to be a symbol of the covenant relationship of love between God and humanity. That is why the Bible commences (Gn. 2: 23-24) and ends (Rv. 19; 9; 21: 9; 22: 17) with weddings. When Israel is unfaithful to God she is described as an unfaithful spouse (Jeremiah 2:20-36; 3:1-13)). Jesus’ first miracle is at a wedding. God is the groom and humanity is the bride. The names of the groom and bride are not given at the Wedding at Cana but John reveals to us that Jesus is the bridegroom: (Jn. 3: 29-30). This passage contains Jesus’ first miracle and he asks his listeners not to call it “miracle” but “sign”, namely of his glory and the faith of his disciples. It is through his glory that they receive the faith. If all marriage is a sign of the wedding of God the bridegroom and humanity the bride, that means that your marriage is also a sign of God’s marriage and what a vocation from God that is for husband and wife; they signs of God’s covenant relationship of love.